UNTIL THE BEGINNING of the last century, the East Coast was a thriving and interconnected string of bays, inlets and estuaries that were nurseries for the ocean’s fishes and wintering shelters for ducks and shorebirds beyond counting. The marshes and broad mucky fields of rushes and reeds were home to mink, muskrat, raccoon, fox and deer. The tides in these marshes rose and fell like a yogi’s calm breathing and bathed the cord grass in their gentle saline waters to feed countless tiny creatures that were the fecund foundation for a rich and mysterious web of life. My little piece of this miracle was the upper end of Barnegat Bay, a shallow stretch of fresh and salt water behind the barrier beaches that stretched from Point Pleasant to Little Egg Harbor. It was a place of cedar-stained estuaries and warm-water lagoons. The bay was inhabited by blowfish, blackfish, bluefish, striped bass, fluke, mummychogs, minnows, spearing, flounder, herring and garfish—all of which were a focus of my predatory impulses as a boy. As a boy, I saw the marshes teeming with ducks and muskrats, as well as the red surveyor flags that marked house lots and future roads. The conflict was clear. I had already developed a nostalgia for the natural world that preceded my arrival in the landscape, and even my birth. The sense of something being lost was already strong in me and no doubt whetted the edge of my consciousness. When I was thirteen, fourteen and fifteen years old, I walked the curving littoral of my piece of the Barnegat Bay in the early summer with a crab net, which was a five-foot broom handle at the end of which was a loop of wire and mesh net. I also carried a metal bucket that I strapped to my waist. My prey was the blue-claw crab and especially the shedder crab. The blue-claw crab increases its size by shedding its hard shell, green as rusted copper, and growing into a new and soggy parchment-like shell. The soft shell crab is a delicacy, of course. In my youth, you could buy them at bars and roadside restaurants where they were breaded and fried whole in flour and egg and served between pieces of white bread. There was a good market for soft shell crabs—I could get a dollar a crab. So in June I would walk barefoot down to the bay, wearing only a pair of cutoff jeans, and waded into the water, slowly making my way through the shallows, looking on the sandy bottom or the edges of docks and bulkheads in search of the dark spots that were crabs. Catching crabs with a net took stealth and speed. I had both. At the slightest sign of danger, they skittered and swam like rockets in their sideways propulsion, or they simply dropped like stones from pilings into deep dark water. Often at the end of a morning, though, I would have a bucket of clicking, hissing and spitting crabs, the big males defiantly waving their knuckled turquoise claws. These tidal vignettes filled my early teens. In the spring, I pursued spawning herring, shooting like silver darts into streams above the swamps. The cedar-stained creek water swarmed with these chromium fish. Maybe it was the age at which I encountered it—twelve going on thirteen, a time not just when a boy begins to stir sexually, but also when he begins to engage the world with an intellectual and moral consciousness—that caused this briny landscape to leave such a deep impression on me. At that age, we are trying out ideas, observing the ways in which the world works in the little worlds we inhabit, and evaluating concepts of right and wrong. All this was happening in me as I walked through marshes, watched sunrises, swam in the brackish bay and netted crabs on sandbars. Copyright © 2011 Lou Ureneck. 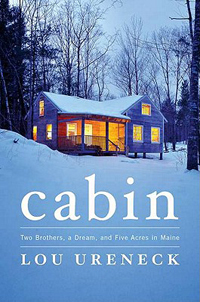 Excerpted from Cabin: Two Brothers, a Dream and Five Acres in Maine with permission of Viking. Read an excerpt from Lou Ureneck’s previous book, Backcast, on MidCurrent.